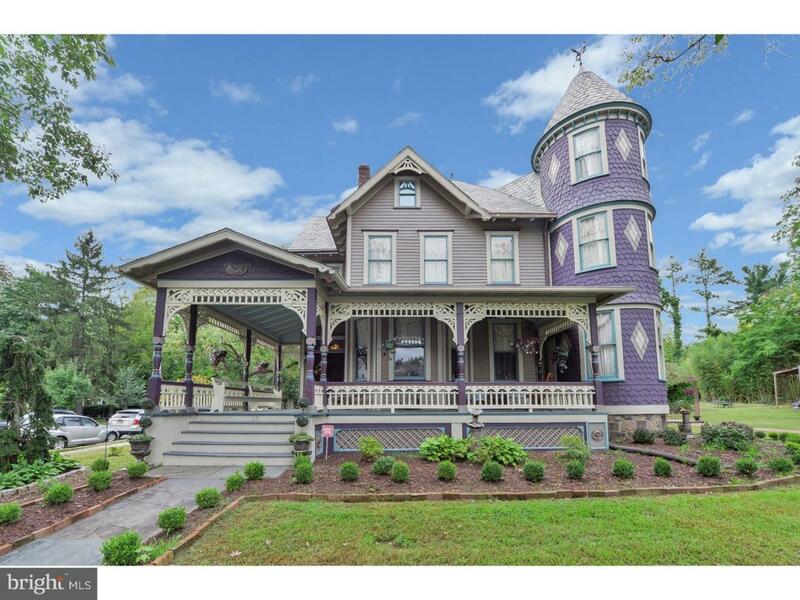 This 3 story Queen Anne Victorian sits on 1/3 of an Acre and has been restored to its original glory. The slate front walkways brings you up to a wrap around porch with beautiful detailed woodworking. Walking into the foyer with front double doors and stained glass windows. As you walk into the home you are greeted with a grand staircase and all hardwood flooring along with a fireplace and sitting area. The living room has 2 fireplaces with custom antique mantles and tile work (1864 mantle in living room). The living room and dining room have crown molding. The dining room has beautiful archways and 4 doorways leading in and out. The gourmet eat in kitchen has been fully updated with stainless appliances, gas stove, granite counter top, island and a bar to sit at. There is a powder room on the 1st floor. Off the back of the kitchen you will find a 3 seasons room with an electric fireplace, fully screened in and has custom plastic eisenglass to keep you warm in the winter. A second staircase (butlers stairs) also lead to the 2nd floor. The second floor has hardwood throughout, a sitting area, 4 bedrooms, an office, laundry room and 2 full bathrooms. The 3rd floor has 3 bedrooms (newly carpeted), a sitting area and a full bathroom. There is a beautiful new slate roof with copper gutters and downspouts and a flying angel on top of the turret. Each floor has a room with a rounded turret area and the windows are rounded as well. All of the windows have been relined with new rope and are in working condition. New windows have been installed in the dining room, kitchen and 3rd floor. The partially finished basement has a game room, bar area, wine room and a powder room. The home has several original chandeliers with crystal/glass. The home has been updated with all new 200 amp service. The home has newer forced gas heat and central air conditioning (3 zones). The grounds are impeccably manicured with a gazebo. A newly built detached 2 car garage with upper sitting area is 1400 square feet with off street parking for 2 cars. The home has custom lace draperies, wallpaper and several windows have custom estate shutters. THIS HOME IS A MUST SEE AND WILL GO FAST!